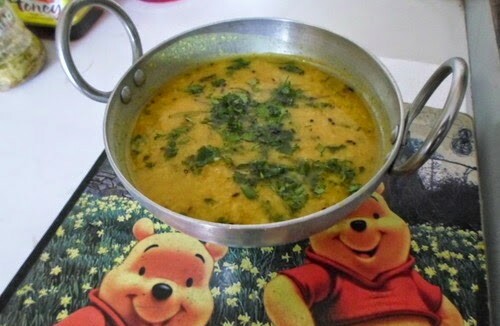 This is a Recipe for Puneri Amti or Dal. This curry recipe is a Maharashtrian specialty dish, originating from the city of Pune; hence the name. Soak cleaned Dal in Water for one hour. Boil it till soft. Add Chili powder, Turmeric, Goda Masala, Tamarind Juice, Jaggery, Coconut, Salt and Coriander leaves. Mix it well. Heat Oil, add Cumin seeds, Mustard, Asafetida, and Curry leaves. When they pop, pour over Dal. Boil thoroughly before serving with Rice.